Interval training workouts are the top routines to burn belly fat and increase lean muscle. 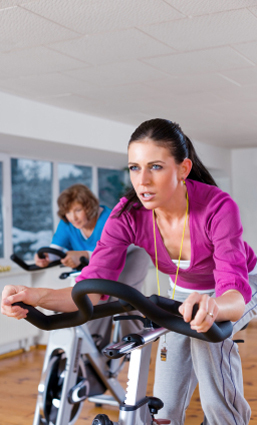 Home cardio workouts and every good workout plan contains elements of interval training. Interval workouts have been around for decades (think "wind sprints" when you played sports in high school) yet, it has only been in the past 10 years, or so, that the general population has been introduced to the term. Interval training is characterized by intense bursts of activity followed by periods of active rest. Although most commonly associated with running, interval workouts are the backbone of conditioning for Olympic and professional athletes, and can be done in activities as dissimilar as biking and swimming. Interval training fat loss is real. It works. The success of home workout programs like Turbulence Training and the ultra-popular P90X Exercise Program are due to the integration of intense cardio intervals incorporated into the workouts. * Interval workouts are much more focused and purposeful than mindless jogging, or reading a book on the treadmill/stationary bike. * Increased aerobic capacity due to pushing yourself with more intensity during each burst. * More calories are burned during intense bursts. This is what the phrase "burn belly fat" is all about. * Increased lean muscle tissue is gained so the body can deal with the increase in exercise intensity. When you gain lean muscle, you increase metabolism naturally. * You will need less time to get in better condition. You can design an intense 20-minute interval workout that will burn more calories than a slow 40 minutes jogging. * In addition to burning belly fat and melting off your love handles, interval training workouts will increase both your speed and your endurance. * Two intense interval workouts each week, integrated with your regular cardio, will provide significant results in your fat loss program. * Interval training will also make you much tougher. When you engage in intense bursts of activity, outside your normal comfort zone, you will definitely be sweaty and out of breath. It takes courage to repeat that intensity 6-8 times during a workout session. Interval workouts are NOT for everybody. You must decide if you have the conditioning level and mental approach to engage in interval training. * These workouts are NOT for beginners. You must increase your strength and endurance to engage in them. * Interval training will make you hot, sweaty, out of breath, and red in the face. Bursts of intense exercise, followed by short periods of active rest, are NOT comfortable. * Make sure you are well-hydrated when you are engaged in interval training workouts. Keep some water near. * More is NOT better. You cannot go daily with extremely intense interval workouts. This is why great programs like the P90X workouts change their routines daily. * Yes, you can do interval training each day, however, you must be acutely aware of the intensity level and frequency/duration of the intervals. * Strength training with weights will help your progress. Please remember, it took time to put on fat...and it will take time and effort to get rid of it. Interval training workouts are not magic. They will accelerate your ability to burn belly fat, but not will not lose 3" off your abdominals in two weeks.